He started to capture the hearts of the viewers and netizens with his cute smile and cool dance moves being a member of the boygroup, the heartthrobs Hashtags in "It's Showtime." Then he becomes part of the feel-good TV series like "Be Careful with My Heart" and "We Will Survive" which spread good vibes in the TV series world. He becomes more popular when he entered the big brother house as one of the celebrity housemates in the "Pinoy Big Brother Lucky Season 7" edition and brought to Vietnam to surpass the different challenges of kuya. 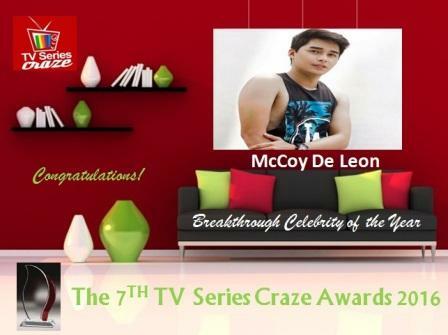 With his achievements and milestones this year in the showsbiz world, McCoy De Leon truly deserves to be our Breakthrough Celebrity of the Year here in our very own, The 7TH TV Series Craze Awards 2016. McCoy or Marc Carlos De Leon even rose in stardom when he is paired to Elisse Joson forming the loveteam called McLisse. Their tandem started in PBB when the two became celebrity housemates. Their tandem then brought them into many TV commercials and endorsements up to supporting roles to Coco Martin in the hit primetime TV series FPJ's "Ang Probinsyano!" McCoy even lead in the fantasy anthology "Wansapanataym Presents: Tikboyong" playing the character of a half-human half-tikbalang young man. The said TV program conquered the national TV ratings game beating its rival shows from the other networks! In terms of TVCs and endorsements, McCoy is the current face of the food chain like McDonalds, the clothing line Surplus, the leading salon line Bench Fix Salon, and the jewelry brand UniSilver to name few. And yes, McCoy even launched his book last month! In terms of music, McCoy together with his boygroup Hashtags launched their first album. They even had their first concert dominating the Araneta Colliseum. McCoy is not only a pretty face. He is truly a leading man in the making with lots of talents in singing, dancing, and acting! He deserves all the blessings he receives right now!